From May 25 to June 5, four people from North Carolina joined BeckyLynn in ministry to the Burji people in southern Ethiopia. Ed Johnson, Danny Chambers, and Jason Evans came from Bethel Hill Baptist Church in Roxboro, NC (bethelhillbaptistchurch.org/), and Amber Nichols came from Mt. Pleasant Baptist Church in Wilkesboro, NC (mpbc.ws). We arrived late Sunday night in Addis Ababa and spent all day Monday getting supplies in the little shops of Addis. Ed and Danny had to learn a new way of plumbing. Bargaining for flooring in the Mercado (“market place”) was something else! But God blessed us with helpers, and after a long, full day the bus was loaded with all our supplies, as well as bottled water. We left Addis at 3:30am the next morning, bound for Burji, and God allowed us to arrive safely at about 8pm. When all was completed, this is what remained of our supplies: 1 screw and 3 small strips of connecting tape. Amazing! Only the Lord of Heaven could have arranged things with such precision. 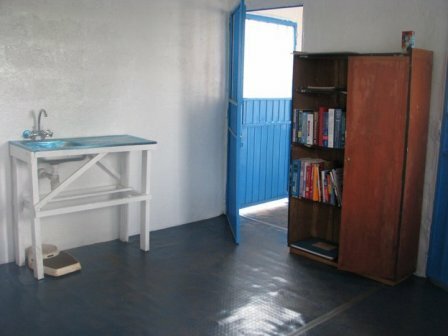 Jason taught a laymen’s Bible Conference on the book of 1Timothy for 3 days, and then he painted the interior of the clinic. He made history in Burji when he used the paint straight from the can, undiluted! Now the clinic has a nice thick coat of white enamel on the walls, with a lively blue trim on the doors and windows. This was Amber’s first trip to Ethiopia, and she was an absolute “natural”! 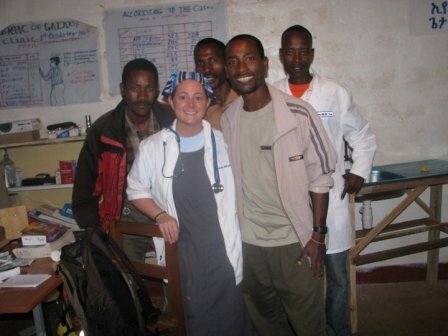 She is a surgical nurse at Wilkesboro Regional Hospital, but she was really in her element at this little rural clinic in southern Ethiopia! Without batting an eye at the flies, the dirt, the poverty, the lack of supplies, the language challenges, she dealt with the patients one by one with quiet efficiency. At one point I even found her doing surgery! BeckyLynn taught a 2-day women’s Bible conference; this was the first ever women’s Bible conference in Burji District! She also did administrative things around the clinic. She established a patient record system, catalogued the Medical Resource Library, in-serviced the medical personnel on computerized reporting, EKG testing, etc, and met with each staff member to deal with issues. A great highlight of the ministry trip to Burji was the visit to the Konso churches. The Konso district lies to the southwest of the Burji District. There are very few churches here, so the Burji churches are reaching out and planting new churches. On Saturday morning, May 30, before the sun was up, we loaded into the back end of an open-bed “refugee truck.” After driving about 7 hours and getting stuck in the mud 3 times, we arrived at the village of Gedene Benea. Throughout this trip, repeatedly the church leaders got in the mud, gathering stones and branches, doing whatever needed to be done to get us to the destination. During a particularly dangerous time in our trip to Konso, I saw this woman, tucked in a little gully, crying out to the Lord for His help. As we approached the Gomede Benea village in Konso, we found a newly-planted church of about 100 people. They were SO excited to see us! During our 2 days with them, we held Bible classes, distributed eyeglasses, showed the Jesus Film, walked through the village and prayed with them. It was a wonderful time! One of the special blessings was to listen to them recite their verses. Like thousands of believers in Burji, these Konso believers were learning the 9 passages of Scripture so that they could get their own Bible. Many recited the passages for us, and some even recited the passages in drama form. It was so neat! These dear believers are so isolated from the rest of the world. In the future, we hope to do more with them. As we traveled to Konso, we carried this very, very sick woman in the back of the truck; she was in her last month of pregnancy, her face was extremely swollen, she had headache, chest pain, and stomach pain, and her blood pressure was 190/130! 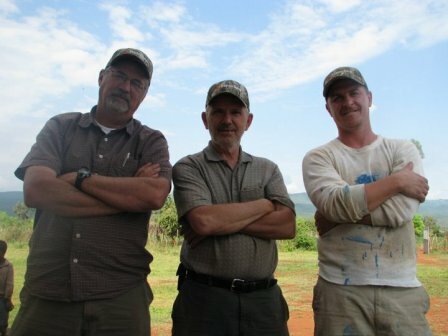 The Lord is impressing us to aim for July, 2010, as the next Team trip. It takes many months to prepare, so already we are beginning the brainstorming/praying segment. As churches join us in the work, we delight to take their representatives, and what a joy it is to watch the Lord cement the relationship across the continents! After all, we serve ONE Lord, according to ONE Gospel, under ONE authority, with ONE purpose, looking to the future around ONE Throne, obeying ONE Spirit, because we are ONE CHURCH! The church of the Lord Jesus Christ!